Toggled LED fixtures are designed to replace less efficient metal halide, fluorescent, and induction fixtures. toggled LED tubes are UL listed, FCC compliant, are rated for 50,000 hours, and have a *limited 6-year commercial warranty. In addition, toggled LED light fixtures do not use ballasts, reduce facility lighting costs, enhance the quality of light, and are mercury free. 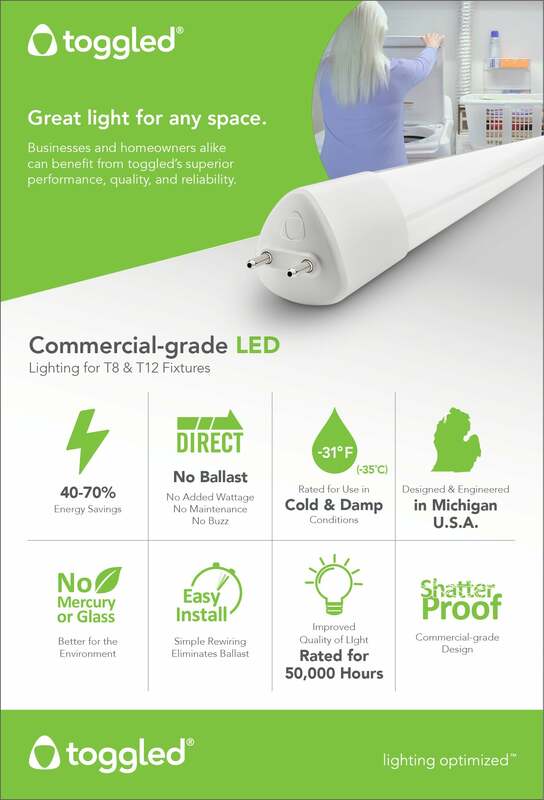 Fixture Dimensions (LxWxH): 48-5/8" x 16-1/2" x 3-7/8"
As with all toggled LED tubes, toggled gro lights are mercury-free and energy efficient, and designed to work in standard T8 and T12 fluorescent tube fixtures. Following a simple retrofit process to bypass the ballast system, toggled gro lights run directly off of building line power eliminating ballast system failures and replacement costs.